Not even 12 hours after the WSL issued a yellow alert for the 2018 Nazaré Challenge, the Big Wave Tour event got upgraded to a green light for a Friday start. The thumbs up in Portugal is especially newsworthy as it will kick off the current Big Wave Tour, checking off the first of three stops on the WSL’s itinerary. And since Jaws and Maverick’s have been mostly idle as the Northern Hemisphere wheels into winter, crossing one of the three tour stops off the To-Do list this early in the season is good news. The window for both the Pe’ahi Challenge and the Nazaré Challenge opened October 1 and the Maverick’s Challenge window opened on November 1. All of them run through the end of March 2019. 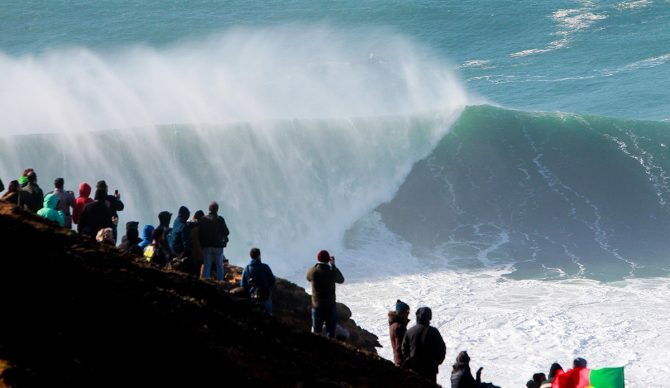 Meanwhile, Nazaré’s already been notably active this season and as BWT competitor Kai Lenny pointed out, part of the challenge in giving the event at Praia do Norte a green light is waiting for a day that’s not too big for the contest. Aside from the BWT regulars in attendance, a lot of eyes will be on Rodrigo Koxa, the man who currently holds the world record for surfing the biggest wave on record. It’ll be Koxa’s first ever big wave event.